Included in this collection is a wealth of live Instrumental loops from Basses, Guitars to Strings, Pianos and Drums alongside classic synths such as the Moog Voyager, Korg MS20 and Virus TI. The collection is divided up into 10 separate construction kit folders with loops chopped into Intro, Verse, Chorus and Leads sections for each individual instrument, all clearly labeled with key and tempo allowing for easy drag and drop arranging in your chosen software. 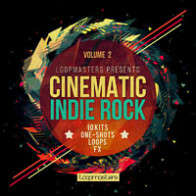 Also included are 20 bonus drum loops, 22 drum fills and 47 guitar FX that can be used alongside the kit content. In detail expect to find 1.2 Gb of 24 bit 44.1kHz Loops and sounds including 84 Guitar loops, 54 Bass Loops, 94 Drum loops, 24 Piano loops, 59 Drum One Shots, 26 Drum fills, 14 Pad loops, 10 Synth loops, 47 Guitar FX, and 42 Drum Loop Rex2 Files. If you produce music for film or television or just want to add some inspirational organic live ingredients into your electronic crossover productions then you should check out this collection now, download the free to use taster pack and hit play on the demo song then sample Cinematic Indie Rock TODAY! - 42 Drum Loop Rex2 Files. 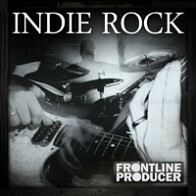 The Following End User License Agreement is included with Cinematic Indie Rock. 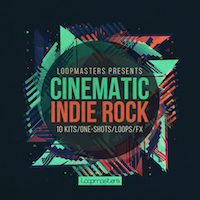 This License is only valid for the individual who has purchased an unopened, new and lawfully made copy of Cinematic Indie Rock from a dealer or distributor authorized by Big Fish Audio.